Steps to reset your password with a "One Time Passcode" (OTP) sent to your email address. When you have a password reset email (non-vcccd) already created, an OTP will be emailed to you automatically. 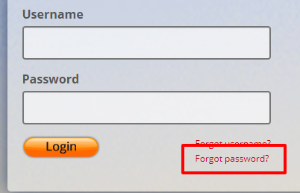 Use the "Forgot password?" link on the login page. Check your non-vcccd email account for a message that will have your One Time Passcode (OTP) and enter that OTP in the text box. Do not include any spaces or other characters. If you do not have access to your password reset email, didn't receive an OTP, or don't have a password reset email, please see steps in the next section. If your OTP passcode worked, create a new password. 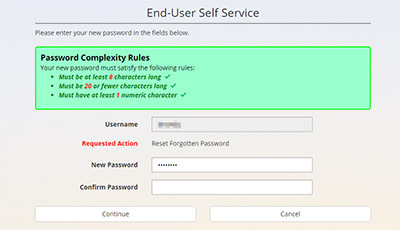 Note the password complexity rules. You will see a screen like the following if your password reset was successful. You may now login to the my.vcccd.edu portal with your new password. If you don't have a password reset email created, or have lost access to your password reset email, the help desk may be able to help you create a "One Time Passcode" in order to change your password. Contact the HelpDesk to receive an "OTP" passcode. Click the "Need help with One Time Passcode" link. Choose, option 2 for a help desk OTP. Enter the OTP given to you by the helpdesk and click continue. If the OTP worked, continue at step #4 in the section above.